Vimentin expression is upregulated at the margins of IPF fibrotic foci. (A) IHC staining showing IgG control and expression of vimentin in formalin-fixed, paraffin-embedded tissue section of a representative subject with IPF. Scale bars: 100 μm. Area outlined in red is the invasive front of fibrotic foci (outlined in blue). 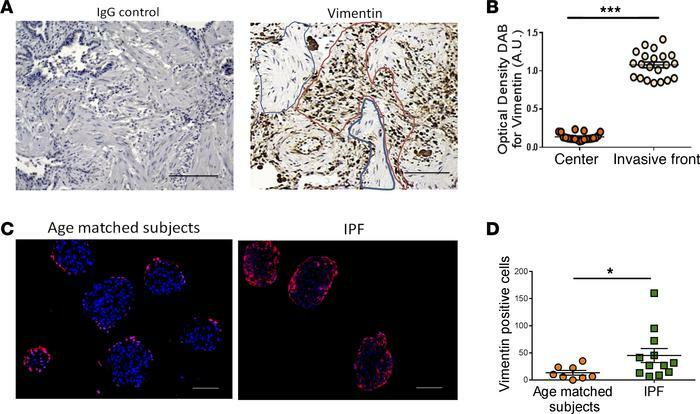 (B) Quantification of DAB-positive vimentin-expressing cells in the center and at the cellular cuffs of fibrotic foci. Graph shows representative results for an individual subject (n = 5). Each dot represents DAB intensity per area. Data are represented as mean ± SD. (C) Representative image of the expression of vimentin in pulmospheres obtained from the cells isolated from control and IPF lung tissue. The pulmospheres were seeded for an hour in collagen gel prior to immunostaining for vimentin (red). Nuclei were stained with DAPI (blue). Scale bars: 100 μm. (D) Quantification of vimentin-positive cells in pulmospheres from controls and IPF subjects. Data are represented as mean ± SD. Each dot represents an individual subject. *P < 0.05, ***P < 0.001.